agile of this year’s films. If you meet your double, you should kill him. Or he will kill you. Double Take targets the global rise of ‘fear-as-a-commodity’, in a tale of odd couples and hilarious double deals. 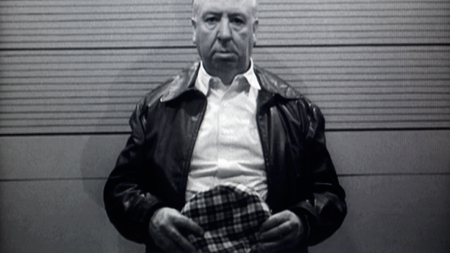 As television hijacks cinema, and the Khrushchev and Nixon kitchen debate rattles on, sexual politics quietly take off and Alfred himself emerges in a dandy new role on the TV, blackmailing housewives with brands they can't refuse. Award winning novelist Tom McCarthy (‘C’, ‘Remainder’, ‘Tintin and the Secret of Literature’) writes a plot of personal paranoia to mirror the political intrigue in which Hitchcock and his elusive double increasingly obsess over the perfect murder – of each other! Subverting a meticulous array of TV footage, Grimonprez traces catastrophe culture's relentless assault on the home, from the inception of televised images to our present day zapping neurosis. 80 min, colour & b/w, english, dolby sr, stereo.